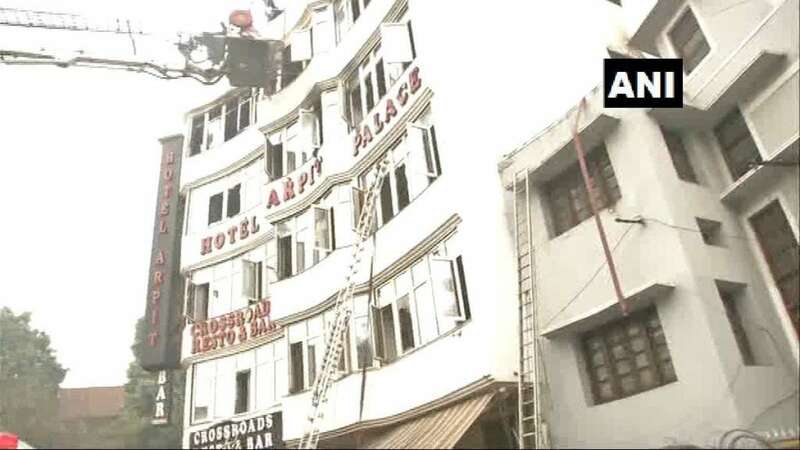 New Delhi : At least 17 people have been killed in a tragic fire at five-storey Arpit Palace Hotel in Karol Bagh (Delhi), said police. Over 35 people have been rescued so far by the Delhi Fire Department. 11 people were severely injured and have been sent to the nearby hospital. Fire Officer Vipin Kental said, "The cause of the fire is yet to be investigated. The rescue operation is over. There was wooden panelling on the corridors because of which people could not use the corridors to escape. "Deputy Chief Fire Officer Sunil Choudhary told ANI, "The fire has been doused. We have to look for bodies, if any, inside the hotel. Those injured have been sent to the hospital. Two hotel staff members had jumped from the fourth floor of the hotel in an attempt to save themselves. The status of the staff who jumped is yet to be known." Delhi hotel association, on the other hand, is claiming that all safety measures were present in the hotel; the license was issued only after inspection.